Geography Cat is delighted to receive this postcard from one of his fellow felines, Felix. As you may know, Felix is Senior Pest Controller at Huddersfield Railway Station. She is well loved by hundreds of thousands of fans across the world for her beauty and grace of course, but also for her wit and wisdom. Felix is a published author and does much work for charity. She is an inspiration! You can find out more about Felix the Huddersfeild Station Cat vis her Facebook page. Huddersfield is a hidden gem, tucked into the confluence of the Rivers Holme and Colne, in the eastern foothills of the Pennines. Geography Cat’s human assistant lived, studied and worked there for many years and is rightly fond of the town. Huddersfield is known for its role during the Industrial Revolution. Luddites, who began in Geography Cat’s home town of Nottingham, became involved with industrial disputes across the country, including the assassination of a Hudderfield mill owner, William Horsfall. Thanks again to Felix for putting her paw print on Geography Cat’s Project Postcard map. 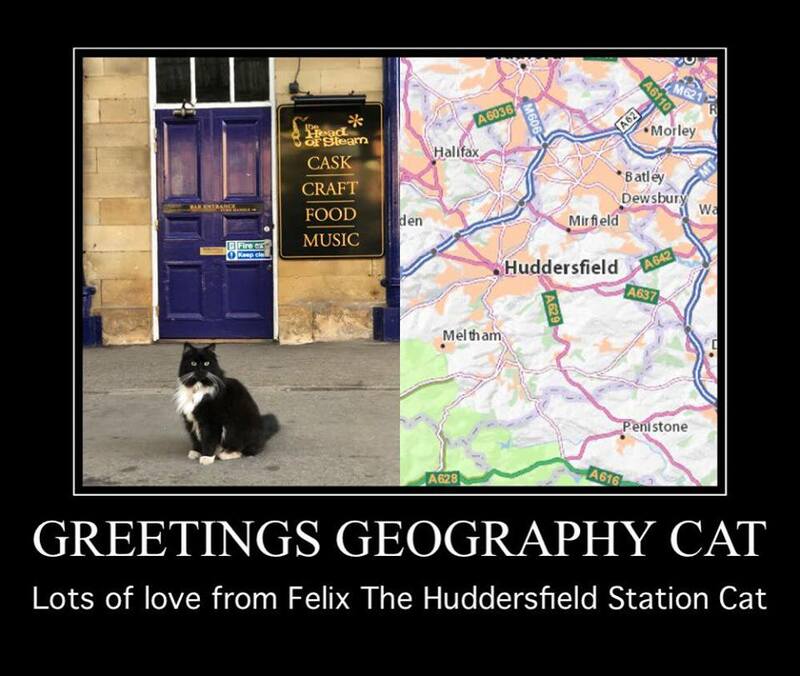 Loved your write up of historic Huddersfield and fellow feline, Felix. Glad to see you are friendly with your fellow feline, Felix! And what a connection to Huddersfield! You’re doing great work Geography Cat! how do I post you a post card?